LLATL looks so simple. Is it really effective? LLATL is simple for the teacher to use and very effective for the student. Research indicates teaching language arts skills in an isolated format is not as effective as an integrated approach. A student may be able to complete a workbook page on punctuation but not include correct punctuation in his own daily writing. When the skills are kept in the context of literature and writing they take on new meaning for the student. This method not only gives the student more understanding for the skills, but also adds to the retention of them. Our mail indicates that students who once disliked language arts when using a basal program, decided it was their favorite subject when they used Learning Language Arts Through Literature. If a student has been using a traditional workbook program, how do I know where to place him in the LLATL series? Will the student be missing important skills by not completing prior books in the series? Since each book in the series is grade based, it isn’t necessary to complete all the prior books in the series. You can determine the best level in LLATL for your student by using the Placement Tests, Scope and Sequences, and Sample Lessons. Your goal is to challenge the student without frustrating him, so keep that in mind as you choose the grade level. Writing and grammar skills are usually reviewed at each level, so the student can successfully enter the series after assessing his current skill level. Does each book cover a full year of language arts study? Each book is designed for a 180-day school year. The 36 lessons are divided into five days of activities. For example, for each lesson you will find Day 1 followed by a, b, c, etc. These are all the activities you would expect your student to complete on Monday. Then you will see Day 2 followed by a, b, c, etc. These are the activities for Tuesday. A review follows each lesson to be used at your discretion. Usually each day’s work will take the student approximately 30 to 45 minutes to complete. The Yellow Book (3rd grade) contains a total of 36 lessons which include four Literature Links. The Green Book (7th grade) and The Gray Book (8th grade) contain 36 lessons which include four Book Studies. The Purple Book (5th grade) and Tan Book (6th grade) contain 36 lessons plus four additional Book Studies. This schedule is offered as a guideline to provide the teacher structure for lesson planning yet allowing flexibility to adjust the suggested schedule to meet the needs of each student. For example, we have many families who group the activities into a four day schedule, leaving the fifth day free for outside activities, service activities, etc. 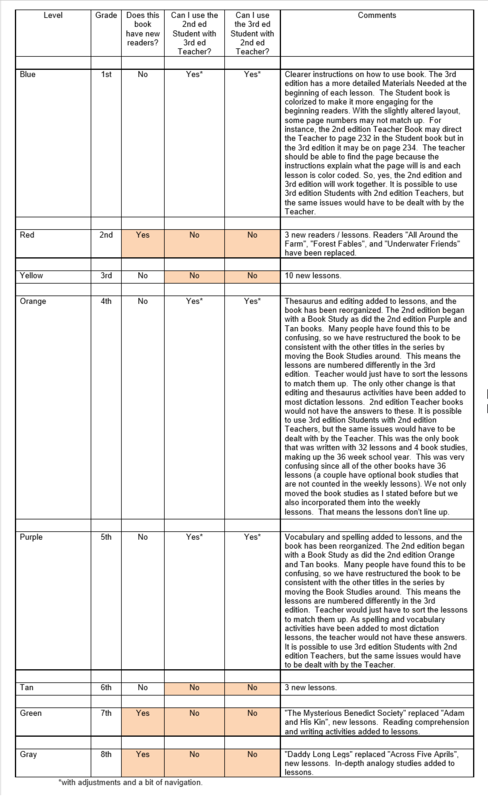 How do I grade my student’s work using the LLATL program? LLATL provides lesson reviews and assessments which may be used in grading the student. In addition, grades and evaluations may be based upon writing assignments, daily work, and dictation exercises. When the students reach the high school level and grades for transcripts become more important, additional test booklets which include course notes, unit tests, and answer keys are available to assist you, as well as a writing assessment service. What is dictation and how can this method benefit the student? LLATL incorporates the dictation method into lessons integrating grammar, punctuation, spelling, writing, and thinking skills. Copying is used at lower levels and is suggested for older students who have difficulty with dictation skills. When a student uses good literature as a model, he is learning to improve his own writing skills. It trains him to look for details, strive for accuracy, and learn to write. Before dictation or copying, read the entire passage to your student. Begin the dictation by reading one sentence at a time. If necessary, repeat the sentence, reading it one phrase at a time. It is important to use your voice to stress pauses and indicate punctuation marks. After dictation or copying, allow your student to use the passage to edit the work. At first, have him check his work one line or phrase at a time. Asking the student to correct the work all at once may prove to be frustrating. Usually the first dictation is given on Monday followed by the same dictation on Friday. Does the student need to read the books used as dictation passages? The only books the student is required to read as a part of the LLATL program are the books for the Book Studies. The dictation passages were chosen from classic literature to complement skills being taught. Although it is not necessary to obtain or read these books, these passages were carefully chosen, not only to teach skills but to act as a “hook” to entice students to read these books or other books written by the author. Any of the books the student chooses to read will be supplemental reading. Although supplemental reading is not required, it is always a good idea to encourage your student to read more often. How is spelling integrated into LLATL? Most lessons have a suggested spelling list taken from the dictation as well as words that illustrate the Spelling Tip for the week that highlights standard spelling rules. You can personalize your student’s spelling lists by adding any words they misspell when taking the dictation as well as from writing done in other areas. What if the student needs more review of the skills? Throughout each level language arts skills are reviewed on a regular basis. At the end of each weekly lesson there is an optional review activity that provides your student with more practice in skills covered that week. Assessments throughout each book help you determine what skills need to be reviewed by your student. Can a student work independently in Learning Language Arts Through Literature? Daily lessons include independent work. The amount of independent work will depend on the student’s ability and the grade level. Higher level books have more independent work. Using the Student Activity Book will increase the amount of independent work your student can accomplish. What is in the Student Activity Book for LLATL? The Student Activity Book is a companion to the Teacher Book. It cannot be used independently. Everything your student needs to complete the program is found in the Student Activity Book, including the literature passages, activities, and plenty of space for your student to complete a task, PLUS there are Enrichment Activities found only in the Student Activity Book, including word puzzles, analogy lessons, and logic activities. At what level of the LLATL program are letter recognition, phonics, and beginning reading skills taught? The Blue Book Program covers beginning reading skills starting with consonant sounds, short vowel sounds, and long vowel sounds. The Red Book Program provides phonics review, new phonetic sounds, and reading skills. I am purchasing The Blue Book and The Red Book. Are the Teacher and Student Activity Books necessary for each? Both the Teacher and Student Activity Books are necessary to the completion of The Blue Book Program and The Red Program. The entire program is needed for each as the Teacher Book references the Student Book and readers. The READERS should not be confused with the REAL BOOK READ ALOUDS. What is the difference between the 'readers' and the 'real book read alouds' in The Blue Book and The Red Book programs? The readers were created by Common Sense Press especially for these programs. They address specific skills so most likely you will not find them available at the library. The readers are necessary components of The Blue Book Program and The Red Book Program. The REAL BOOK READ ALOUDS should be available at the library or on your shelf. The REAL BOOK READ ALOUDS are used to teach story skills such as setting, sequence, characters, and plot in The Blue Book Program and The Red Book Program. The literature PASSAGES contained within The Red Book Program are excerpted from books that are very, very old and most are out-of-print and impossible to find. These books are NOT necessary to the program. These were chosen for copying and/or dictation to complement skills being taught. The materials packet is a necessary component of The Blue Book Program. It includes cards used in phonics instructions, sight words, and games. How do you use the Book Studies? Should my student read the book before beginning a Book Study? The Book Studies are units on an age-appropriate novel. Since we do not know how long it will take your student to read the novel, we suggest you introduce the book, allow him to read it, completing activities along the way, if needed, and completing all the activities when the novel is read. If you are using a Student Activity Book, your student may use it for vocabulary words and discussion questions as he reads the book. While your student is reading the novel, continue with Dictation or Everyday Words Lessons. We encourage you to be flexible when using Learning Language Arts through Literature. Most teachers we speak to allow a week or two for each Book Study. Does the Learning Language Arts Through Literature series contain Christian content? The Learning Language Arts Through Literature series is written from a Christian viewpoint and contains some Christian content.